Bayesian Computation with R focuses primarily on providing the reader with a basic understanding of Bayesian thinking and the relevant analytic tools included in R. It does not explore either of those areas in detail, though it does hit the key points for both. As with many R books, the first chapter is devoted to an introduction of data manipulation and basic analyses in R. This introductory chapter focuses more heavily on analyses that many of the other similarly focused chapters in other texts. The new R user who hasn’t yet built up a library of these chapters will find it useful, but for experienced R users or those with multiple R texts, there is little new information. Albert’s introduction to the foundational Bayesian concepts (e.g., Bayes’ theorem) is concise and will be clear to those with a statistical background, but others may need to refresh their statistical knowledge before they can fully grasp the content in the second chapter. Those from programming backgrounds without extensive statistical knowledge may be better off beginning with a text that deals specifically with Bayesian analysis. Many of the topics discussed in this text have limited application, but possibly the most broadly applicable chapter deals with Bayesian regression. Those interested in learning how to run and diagnose Bayesian regression in R will find almost everything they need to know here. As with many R texts, Bayesian Computation with R has an accompanying package of functions available on CRAN (“LearnBayes”). The functions in this package are focused mainly on teaching Bayesian analysis, but also include some useful basic implementations. This book straddles the line between introductory theory and intermediate-level statistical programming. Because of the omissions of information on each side of that line, the reader will get the most mileage from the text if he or she has access to resources (i.e., other texts, colleagues, or previous knowledge) that can fill in those omissions. For that reason, it would work well as a text for an upper-level course on Bayesian statistics and their application, but it is not well suited as a reference text, or as a guide for real-world analysis. Overall, I recommend this book, with the caveat that interested readers should review the sample pages available on the Springer website here and the functions in the “LearnBayes” package. The text is currently available at Amazon for approximately $55 in paperback and $20 for the Kindle version. I bought this book via a textbook buyback program and it was 140% worth it ( if you get the joke ). 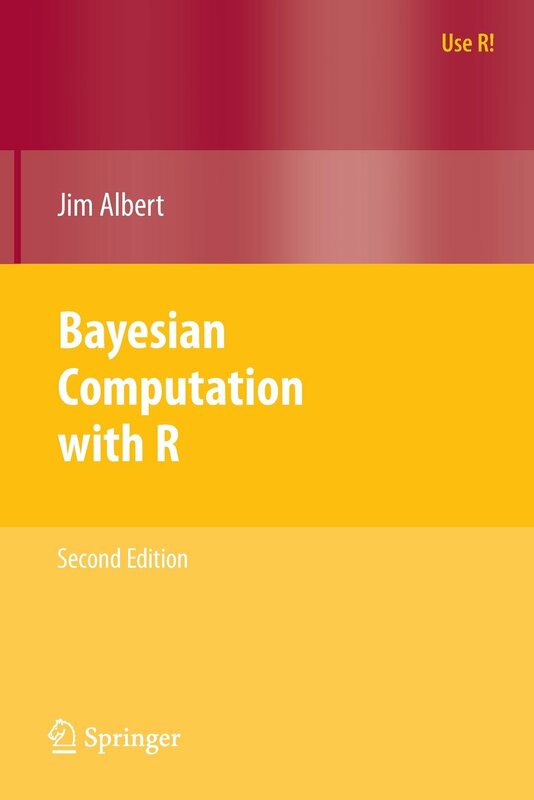 Bayesian Computation with R is one of the best books I have read so far in this domain and maybe even it is the best book in this domain.